See that traffic lane between the yellow lines? It’s called a center turn lane and it should be used only when a driver is ready to make a left turn. It should not be used as a driving lane. I repeat, you should only use it to get out of the busy lane of traffic when you want to make a left turn. Should be common sense, right? Well, yes, if common sense was a requirement to have a driver’s license. But apparently it’s not, and that’s how many accidents occur. Like this one, that caused $4,000 in damage to my beautiful truck. I signaled to get into the center turn lane, and yes I saw the oncoming car a ways back in the same center turn lane. But it was a center turn lane after all, and despite the fact the car didn’t have its signal on, I figured it was preparing to turn. It was a center turn lane after all. Did I mention that already? Unfortunately for me, the car was not turning and kept coming at my vehicle, which also was now in the center turn lane. Rather than have a head-on collision, I opted to make an “evasive maneuver” — I went back into the lane of traffic from where I had come. 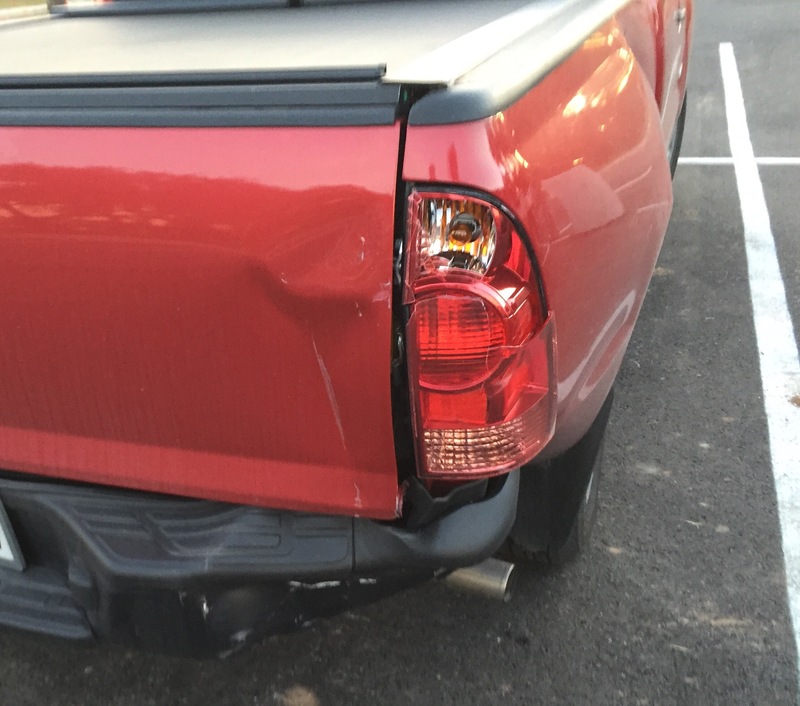 Of course, the much bigger Chevy Tahoe behind me did not expect that and rear-ended my truck. The impact was minor, and thankfully, no one was hurt. Even the trucks sustained fairly minor damage, but of course, the police had to be called and it was a major inconvenience for those involved. So, I lost the game of chicken, and in the process, took another driver down wirh me. And the stupid driver who used the center turn lane as a driving lane (if I was Stephanie over at Stephellaneous.wordpress.com/, I’d be using a much stronger word to describe the driver!) got away as though nothing happened. Like I said, no one got hurt, and that’s the important thing. Vehicles can be fixed. And that’s what I have insurance for, right? But it ticks me off that people drive stupidly and cause needless accidents–and then don’t even have the courtesy to man up to their mistakes. Jerks. 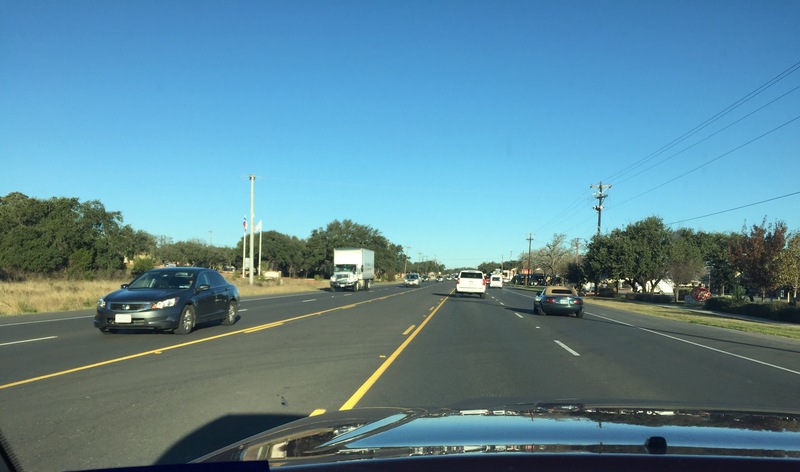 This entry was posted in Living and tagged driving, responsibility on December 18, 2015 by Julie Riebe. You’re darn right I’d be using stronger language! Ohmygosh, I’m so mad for you..glad you’re okay!!! Only thing hurt was my pride, and I’ll get over it! Yikes. And that is why I can’t carry a gun in my car. Because I would be firing at that car in the center lane as soon as I got out of my car that just hit the other one trying to avoid the idiot. And that wouldn’t be good for anyone!